(pink) elephant in my pocket: Not Me Monday!! 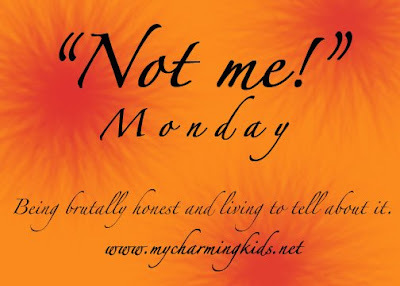 for my first go at Not Me Monday! i would like to begin by being brutally honest. i do not (and i repeat do NOT) blog-stalk the creator of this fantastic therapeutic session (that would be MckMama). who has time to stalk other peoples blogs anyway!? i am a busy mama - cooking, washing diapers, chasing Pirates, killing bugs, gardening, cleaning toilets, doing dishes, grocery shopping, etc. i definitely do not check out MckMama's blog 2 (or 5) times a day. i was not involved (in any way, shape, form, or fashion) in the catching and setting on fire of the TOMATO HORNWORMS that have taken over my (only) 3 tomato plants. i wasn't there and had no clue that was going on in my own back yard. and i truly did not *sigh* in satisfaction as they crisp-ified because they destroyed at least 20 tomatoes. if you asked, i'd have no clue about the diapers that sat in the wetbag all weekend because i was having too much fun to even look at the laundry. i always keep up with the laundry. i had nothing to do with it! NOT ME! i did not beg my dear mother-in-law to come over (twice!) this weekend to help me with my sewing project. uh-uh! not me! that sewing class i took last fall taught me everything i needed to know - and i paid perfect attention the entire time. lastly, i did not just tell my adorable Pirate to go find his trucks, whees, or a ball as a distraction so i could quickly type up this post. so next time you point in my direction... just remember there's three fingers pointing right back at you!! besides! it wasn't me! Sounds like you had a very eventful weekend. What are you sewing? I wish I could sew...I can't, maybe one day. cousin! i'm impressed. the blog is coming along quite nicely & you're keeping up with it so good. yay!! !